22 Michaels: Procrastinate No More! One of the things I've always wanted to eliminate from my life is procrastination. I actually wrote that down as a key thing I wanted to change in an MBA assignment a few years ago. Procrastinating isn't enjoyable and isn't productive. The other day I had to write a contract for an agreement we're setting up with a partner and, just like with every one of my law assignment at uni I found myself procrastinating. 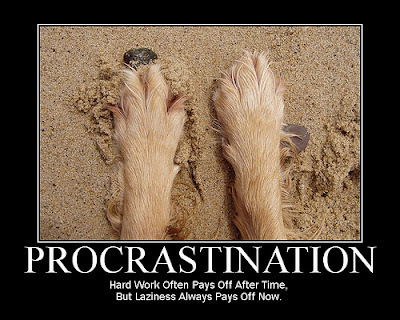 The great thing was though, I realised it was the first time I had procrastinated in a long time! Day to day a lot of what I do isn't exactly exciting. I review our orders, discuss them with the workshop, email with customers and do our accounting. But these often mundane things I actually enjoy doing, and am motivated to get done quickly and efficiently because I'm doing them for my own business. I get the full reward if I do them well, and I suffer the full pain if I don't. So I do them without procrastinating. This is wonderful. When I think back to my University days and even some of my work days working for someone else there were a lot of good times, but I clearly remember the pain of procrastinating. Procrastination is no more. This is good. Now here is a quandary...how do you differentiate between reflection and procrastination. On a serious note though I think reflection is underrated and hugely important. And it's something that's easy but bad to skip in a startup.